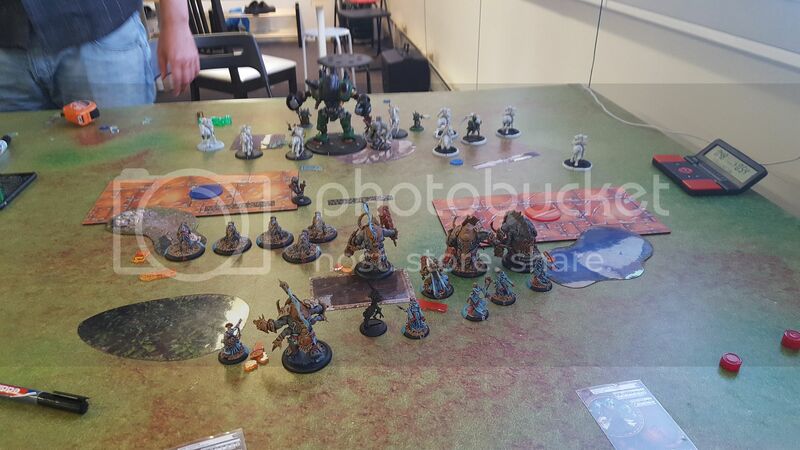 Following the close fought game against Trollbloods, i got the chance to play against more Cygnar (roughly 50% of the players in the local gaming club plays them (at least that's what it feels like), so every bit of practice helps). He only had one list with him, Stryker2 with Stormwall and Cavalry. I'm pretty confident i can deal with this with Makeda, but what about Xerxis? Time to bring the Paws of Halaak into the light again! Scenario was Entrenched and i won the Roll off, deciding to go first! His list looks deceptively small, but there's tons of quality there. Storm Lances are still the best cavalry in the game (Narrowly beating the Ferox), and Stormwall is, and will always be Stormwall. Stryker himself is ofcourse no weakling himself, possibly being the Model with the highest damage output in the entire game! (Together With Madrak and the Butchers). But then again, I'm survivable as F***!! The titans can handle a lot, and Ferox with Defenders Ward and Tough is a real pain to deal with. I deploy centrally with Ferox and the Zaadesh package on my left, the rest on the right. He deploys the large Lances on my Right flank and the small one together with Stryker on the other flank. Stormwall in the middle. Forgot to take a picture of the deployment again..
Cygnar Moves up. Stormwall deploys a pod so that he can arc lightning on the Ferox, but all of his shooting (Stormwall as well as i forgot to make sure i was outside of his shooting threat), doeas pretty much nothing. The whole point of pushing so hard forward T1 was to make sure he advanced very cautiously. That worked pretty well, so now i moved back a bit to stay outside of Storm Lance threat with Ferox. One of them kills the lightning pod (I hate those damn things!) The Titans advance a bit to cover Xerxis who moves into my zone. I'm pretty sure i can survive his Alpha since there's only the Storm lances that can get in. He commits the Large Storm Lance unit, and as predicted he does very little damage. Bronzeback even gets to countercharge one of them to death! 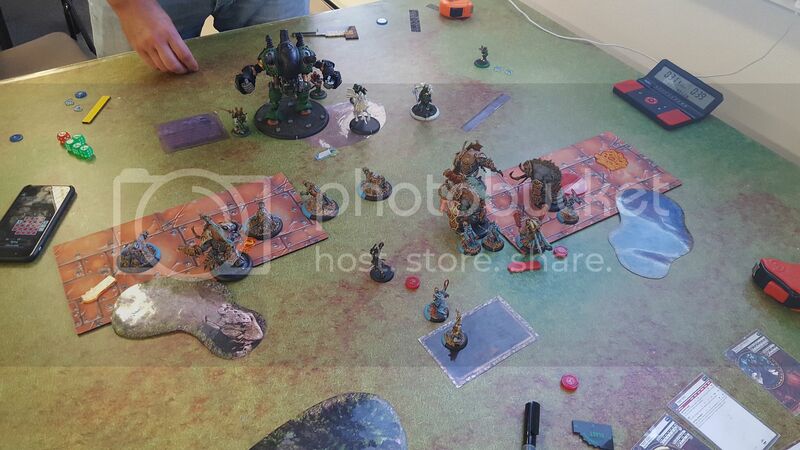 Stryker does not dare going in to Score because of the Ferox, but spells and Shooting manage to kill one of them. He also commits the Firefly so that his electro leaps deal additional damage, but unfortunatelly for him it had very little effect. I see a huge Scenario opening here. With Stormwall still hanging back, clearing his zone should be relatively easy. If i can kill the Objective and clear my own zone i can move to 3-0 and really put pressure on my opponent. And in doing so, i also clear out pretty much everything he can contest me with as well. 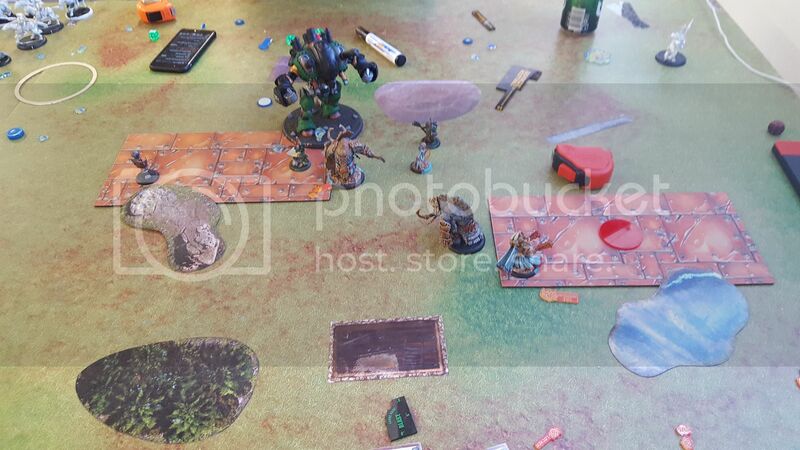 Xerxis slams the Firefly out of the zone, through a pod that he dropped to arc lightning from, and into a Storm lance. The lance and Pod dies, and the damage on the Firefly spikes. The Titans clear the rest, and kills off the Firefly. 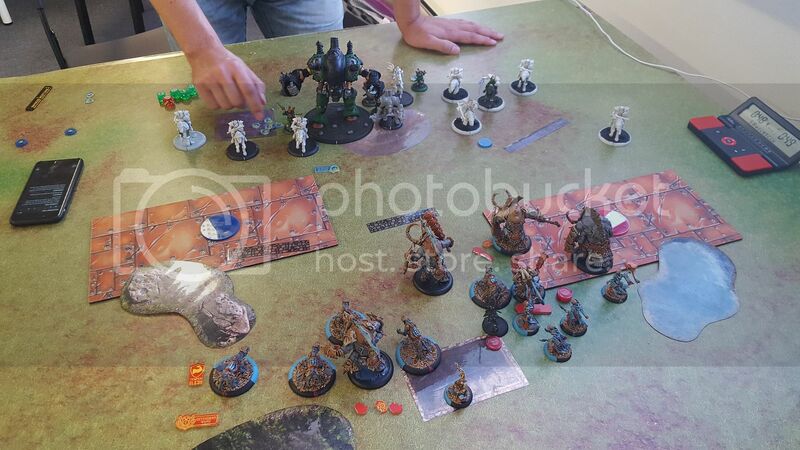 Ferox kills the Lances in his Zone and Gladiator kills his Objective, and i move to 3-0! He really have to commit now, to stop me from winning on Scenario. 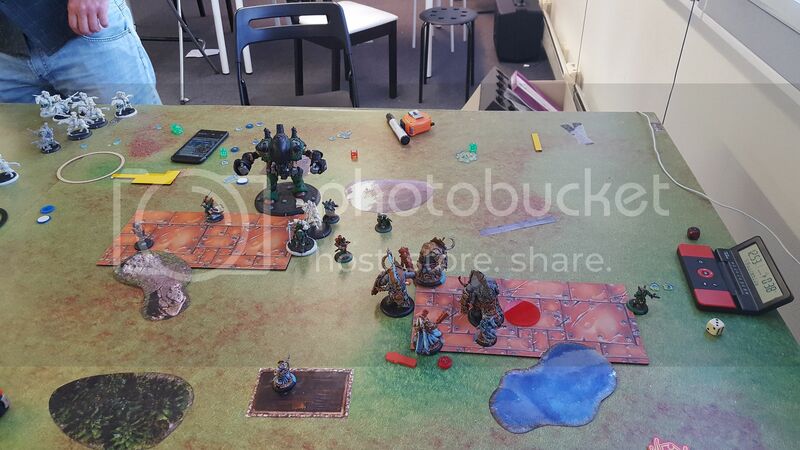 Junior runs in to contest, and even manage to find a spot where i can't reach him.. Stryker Feats and with the help of the Stormwall kills the Gladiator, Zaadesh and the Ferox. I realized during his turn that i should just have Run Zaadesh over to my own zone to help clear contestors after the Gladiator had done it's thing. The willbreaker would have made sure that the Titan would still be in "control" and i could really have used him in clearing the damn Junior Warcaster that now stood safe and sound in my zone. Since i can't kill the damn Journeyman, i move Xerxis and BB so that there's no possible escape for him next turn. I run Willbreaker in to Contest (Again, probably a mistake as you will see later) and my two tankiest Titans move to kill the rest of his possible Jammers. But i roll insanely crap on my attack and damage rolls, and only manage to kill three out of five. This totally screwed me over. 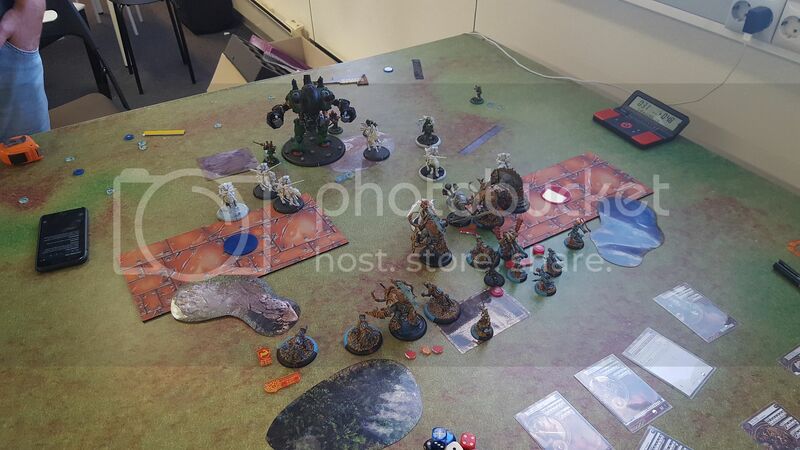 He'll still probably not be able to contest me with the remaining two, but Tiberion's Overtake was supposed to move him to Jam Stryker down far from the Action. 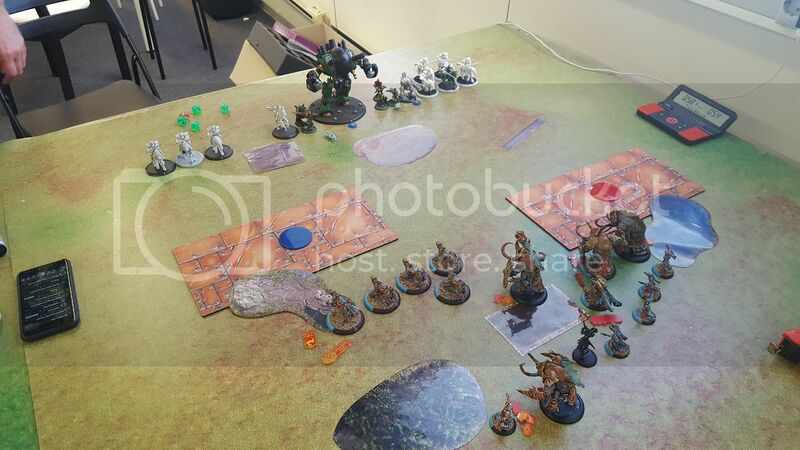 Both beasts were pretty much undamaged, so he would have to really work to kill them both, and Stryker had allready taken 10-ish damage from an overload when he killed the Gladiator, so trying for more would be really risky. I forgot to take a picture after his turn, but what he does is to kill Tibbers, and scratch the Sentry a little. Junior does not upkeep Arcane Shield and moves to a position where BB won't reach him. To no avail. Stormwall brings him down to a single Box (Meaning i don't get the Fury that could have saved me through transfers, and with both Mind and Body Crippled, Stryker easily tanks a free strike from him. Narrowly getting past the BB, and with a risky Overload (He decides that it's all or nothing at this point.) 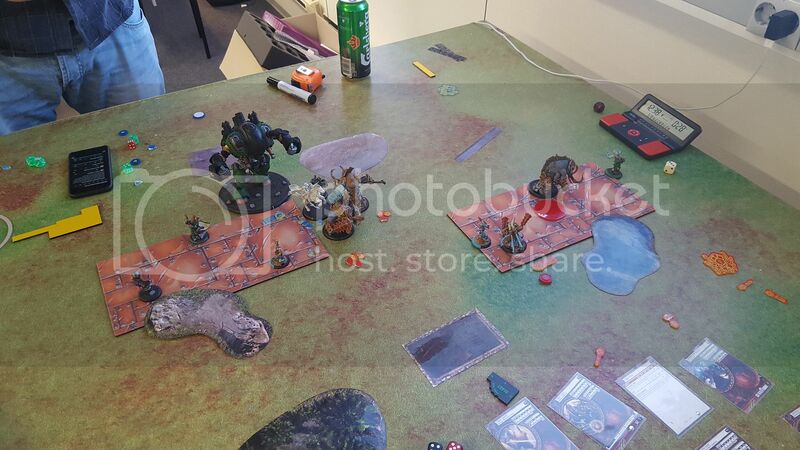 Xerxis goes down. Yet again, a tiny mistake cost me the game. I should have upkept TacSupremacy, slammed the Journeyman out of the zone and then repositioned to a safe position. Had i done that Stryker would never have been able to go for the assassination and the game would have been mine. I'm pretty happy with the list, though i feel like it could be better. I might try to free up some points for Radheim. Dodge on DEF 15 Ferox is just plain ridiculous. Anyway, Xerxis still makes his Army smash face like no other, and the Ferox adds a long range element to the ARM cracking list that just isn't there with the alternative beast bricks of Xeekaar and Rasheth. I feel that it compliments Makeda pretty well, but there's much more testing to do before i'm happy with the pair.